Here is the banner designed by co-curator Richard Brook to promote our new exhibition, Infra_MANC. The banner will hang outside the CUBE Gallery in Portland Street, Manchester that is hosting the exhibition. We are just the hectic phase of installing the materials in the exhibition itself. We have a lot of interesting plans, maps and artefacts to display. As well as four videos, and hopefully the Futuroute machine on loan from the Transport Museum of Greater Manchester. The exhibition opens officially next Monday, 27th February. I am really looking forward to seeing it finished and the reactions of visitors. There is also a substantive catalogue, running to over two hundred pages, to support the exhibition. This is being printed and will be available in a week or two. We'll need to sell the catalogue to cover the print costs but might well release it free online as a pdf. 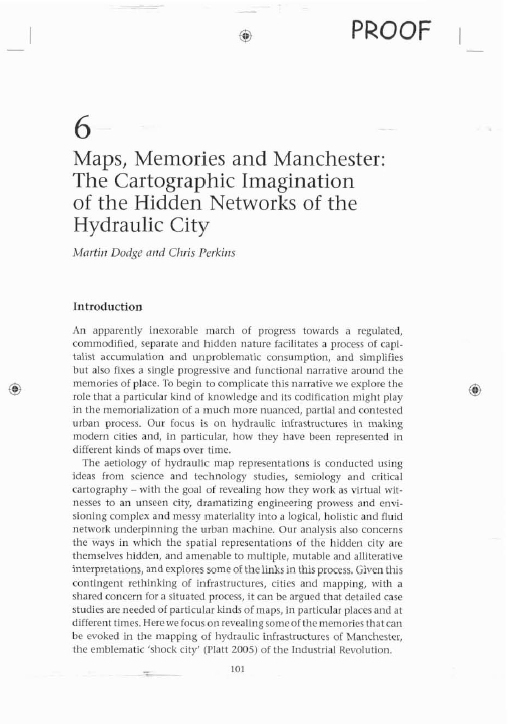 I also wrote a entry for the Cities@Manchester blog, entitled 'Contemporary cities and infrastructural imaginaries' that tries to delineate some of the ideas behind the exhibition. Here is the uncorrected page proof version of a book chapter I co-wrote a while back. 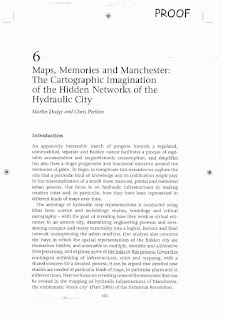 Maps, Memories and Mancheste: The Cartographic Imagination of the Hidden Networks of the Hydraulic City looks at the mapping process of water system and historial geography of infrastructure in Manchester. The chapter will be part of a forthcoming book, Mapping Culture: Place, Practice Performance, being edited by Les Roberts.